Akiko Takei (email: aktake1121@hotmail.com) is Professor at Chukyo University, Nagoya, Japan. She has studied eighteenth-century and nineteenth-century British novels and medical history, and has published articles in Eighteenth-Century Fiction, Dickensian, and Persuasions. “‘Perry tells me that Mr. Cole never touches malt liquor,’” Mr. Woodhouse says in Volume Two, Chapter Seven of Emma. “‘You would not think it to look at him, but he is bilious—Mr. Cole is very bilious’” (210). Mr. Woodhouse deems Mr. Perry “bilious,” too: “‘Poor Perry is bilious, and he has not time to take care of himself,’” he says (101). These examples show that the term “bilious” was widely and incorrectly used by the general public, and that a sallow or dusky complexion was regarded as the primary symptom of this affliction. James Makittrick Adair, a physician at the General Hospital in Bath, was critical of the misuse of this term. In Medical Cautions (1786), he wrote that while “bilious” strictly meant the secretion of too much bile, a yellowish complexion was caused by a lack of bile. Thus, a yellowish complexion was not to be identified as a sign of being “bilious” (20-25). At the turn of the nineteenth century, however, the professional and lay usages came together in the definition of the term “bilious.” In 1802, A. F. M. Willich, a London doctor who came from Germany and co-edited the Medical and Physical Journal from 1799 to 1801, explained that “[i]n the temperate climates, however, a vitiated and superfluous bile is more frequently diffused through the whole body. In this case, the skin assumes a yellow colour . . .” (1: 256). Mr. Woodhouse might unthinkingly have applied the term “bilious” to everything simply because this word was popular. However, such confidence in identifying diseases was typical of the character of the lay public in Jane Austen’s lifetime. Roy Porter views the seventeenth and eighteenth centuries as a period during which educated laymen sincerely believed that “they could talk the same language as the doctor and understand medicine on a par with him” (Disease 24). Practitioners such as Mr. Perry offered their patients a variety of medical advice, and unlike today’s doctors, they would spread rumors about the physical conditions of local residents. Moreover, the lay public too would consult medical manuals. Austen’s novels demonstrate that she had a lifelong interest in matters related to medical treatment and ways to preserve health. From her juvenilia to Sanditon, the cure of disease and the maintenance of health are concerns common to most of Austen’s characters—not merely to the health-obsessed like Mr. Woodhouse. As Porter suggests, Austen’s characters are more self-reliant in the handling of diseases and injuries than today’s patients. The results, however, are not always satisfactory: their trials and errors often manipulate the plot. To show the extent to which medical knowledge is disseminated among Austen’s characters, and the crucial parts played by events related to the preservation of health, three types of doctoring should be explored: ineffective doctoring, good doctoring, and doctoring by know-alls. Thus, we gain an understanding of how Austen’s characters prevent disease and maintain their health and that of others without professional help; further, we develop an insight into Austen’s stance on the issue of doctoring by the lay public. These analyses are helpful to better understand Austen’s artistic technique as the ability to doctor becomes an index of her characters’ moral qualities and means of influencing their relationships. Austen’s characters typically resort to self-treatment to heal injuries and diseases, especially minor ones. In Sanditon, Mr. Heywood says that his house is “‘always well stocked . . . with all the common remedies for Sprains & Bruises’” (367). It seems that no practitioner comes to attend to Marianne Dashwood’s sprained ankle, Mrs. Bennet’s hysteric fits, Fanny Price’s ailments, or Mary Musgrove’s low spirits. These are some of many examples in Austen’s novels that suggest the popularity of home treatments. In her lifetime, knowledge related to self-care and self-medication was regarded as indispensable. Dorothy and Roy Porter compare a person of this era without medical knowledge to “a woman unable to bake, stitch and manage the servants” or “a gentleman who could not ride” (35). In Austen’s novels, the details of amateur medical treatment are specified on many occasions. For instance, in “Jack and Alice,” a comic example of a brilliant lay surgical operation is presented. Although she has no medical experience whatsoever, Lady Williams cures Lucy’s fractured leg with “great skill” (22) on the spot. Anita G. Gorman argues that this excellent surgery is absurd and represents the young Austen’s penchant for laughing at nonsense (96). Gorman’s suggestion is right: the miraculous feats of a medical amateur are never used again to form part of any of Austen’s plots. In her later novels, especially in Sanditon, Austen increasingly makes fun of amateur practitioners who think that they can “heal” others by bossing them around. In “Catharine or the Bower,” a girl’s effort to cure herself is shown more realistically. “Catharine” is Austen’s only work where the existence of a medical manual is clearly referred to. Attacked by a sudden toothache, Catharine, aided by her housekeeper and maid, tries “every remedy that the receipt book or the head of the [housekeeper] contain[s]” (208). The name of the book is not specified, but it is undoubtedly a medical advice book, similar to John Wesley’s Primitive Physic (originally published in 1747), or William Buchan’s Domestic Medicine (originally published in 1769), or even Elizabeth Smith’s The Compleat Housewife (originally published in 1727). The housekeeper’s knowledge, too, is probably based on such books. Medical books, especially those written for household use, were characterized by their listing of a variety of alternative treatments for every possible ailment. If one option did not work, a patient had only to try the others. To understand this, references to best-selling medical manuals in Austen’s lifetime are useful. For instance, in the 1792 edition of Primitive Physic, nine treatments were advised in the entry on toothache. Aside from the electric shock cure, the other eight could be easily tried at home; these included, for instance, placing a magnet adjacent to the aching tooth, rubbing the cheek for fifteen minutes, and placing roasted turnips behind the ear (101-02). The 1803 edition of Domestic Medicine proposed more treatments than the 1792 Primitive Physic had: simple techniques such as inserting a toasted fig between the gum and cheek, and applying a bag containing boiled chamomile flowers to the affected part as well as uncomfortable ones like vomiting, purging, and applying leeches to the teeth had been newly added; further, the 1803 Domestic Medicine also mentioned complicated remedies such as the blocking of dental nerves with a hot iron (336-37). The Compleat Housewife gives three “receipts,” including dropping “three drops of the juice of rue into the ear on that side the tooth acheth, [and] let it remain an hour or two ” (301). While the exact remedies that Catharine tries are unknown to us, she is likely to have resorted to some of these treatments. To her disappointment, however, none of these methods work at all. Her trials are comically described, but her desperate efforts were an experience common to laymen who tried self-doctoring. “Taking Physic” by Richard Dagley. From Takings, or, the Life of a Collegian, 1821. Courtesy of Ancestry Images (www.ancestryimages.com). With Lady Williams’s surgery in “Jack and Alice” Austen merely aims at laughing at nonsense while in “Catharine or the Bower” she more skillfully uses Catharine’s toothache and self-doctoring to exhibit her disposition and advance the plot. Her disappointment at having to cancel going to a ball underscores how joyless her daily life is with her strict aunt Mrs. Percival, and her desperate self-cure invites the reader’s sympathy. Her endurance and resignation point to her fortitude and efforts to make her life as pleasant as possible. Fortunately, her toothache calms after a time, and she can belatedly attend the ball—because of the delay, she has to go with Edward Stanley without a chaperon, fueling Mrs. Percival’s anger. In her mature novels, Austen emphasizes more distinctively the uncertainties associated with lay treatments and thereby indicates human relationships in a small community. Mrs. Jennings’s incorrect knowledge of gout may be cited as a case in point. Mrs. Jennings advises the lovelorn Marianne to take her late husband’s favorite wine, which he strongly believed to be good for his gout. A nervous breakdown and gout, of course, are ailments of entirely different natures: what is good for gout is not necessarily good to treat a nervous disorder. Further, this treatment should not have been recommended for gout. With alcoholic drinks, the constitution of the patient could become plethoric, thereby making the cure more difficult to achieve. Mrs. Jennings, however, unthinkingly convinces herself of her husband’s incorrect knowledge. The absurd treatment proposed by Mrs. Jennings shows that the lay public used to try, almost at random, their limited treatment options, and that useless treatments were handed down from one generation to the next. The medical enlightenment of the public had not yet been realized. As well as suggesting the standard of medicine in Austen’s lifetime, Mrs. Jennings’s advice to Elinor represents power relationships in a community. In lay medicine, the social standing of the advisor is higher than that of the advised: the right to doctor corresponds to the extent of decision-making ability an individual possesses. After settling in Barton Cottage, the Dashwood household is dependent on the Middletons and their circles. Thus, Mrs. Jennings is in a position to offer Elinor advice, and Elinor politely listens to whatever Mrs. Jennings says even when it is wrong. This medical hierarchy is seen also in Austen’s other writings, as in the case of Mr. Woodhouse and other Highbury residents. Whether medical advice by amateurs is welcomed or not depends on the degree of the advisors’ understanding of what the advised really need. Mrs. Jennings is certainly officious and unrefined. Yet her care and love for the Dashwood siblings are shown when Marianne is attacked by a fever. These descriptions by and large fit the changes in Marianne’s condition. Throughout Elinor’s nursing of Marianne, Austen vividly describes the futility of home remedies and indicates Elinor’s immaturity. Both Mrs. Jennings and Brandon are aware of the seriousness of Marianne’s condition, but Elinor is so optimistic that she believes the efficacy of a good sleep. The family practitioner of the Palmers, Mr. Harris, lives nearby. However, he is not called at first. Instead, prescriptions “poured in from all quarters” (306), only to be rejected by Marianne. Elinor persuades Marianne “to try one or two of the simplest of the remedies” (306) and unsuccessfully prescribes what she regards as “proper medicines” (307). These descriptions make it clear that everyone around Marianne responds to her condition by trying to think of home remedies to treat a cold, and Elinor practices whatever options are available to her. Marianne’s condition, however, is too serious to be cured by sleep or simple treatments. While it is unfair in such a situation to put the blame on Elinor alone for Marianne’s near death, clearly Elinor is as careless as Marianne and later reproaches herself for her folly. Even after asking Mr. Harris to visit, Elinor keeps up her efforts to diagnose Marianne’s condition. On Days 11 and 12 in the chronology above, Marianne’s condition undergoes dramatic changes. On the morning of Day 11, Mr. Harris observes that she is “materially better. Her pulse [is] much stronger, and every symptom more favourable than on the preceding visit” (310). Mrs. Jennings is pessimistic, but Elinor is sure of the recovery. Her optimism carries on until the early evening. She ascribes the reappearance of the bad symptoms in Marianne to “the fatigue of having sat up to have her bed made” (310). Her diagnosis is wrong again. The rapid changes in Marianne’s condition were considered common to pleurisy and pneumonia; they did not always imply a critical condition. Buchan writes, “What is called the crisis, or height of the fever, is sometimes attended with very alarming symptoms, as difficulty of breathing, an irregular pulse, convulsive motions, &c. These are apt to frighten the attendants. . . . But they are only the struggles of Nature to overcome the disease” (162). Marianne’s symptoms are alarming, but she recovers through the processes peculiar to her disease. This prognosis, however, is unknown to Elinor, who, on finding Marianne’s pulse “lower and quicker than ever!” (311), is nearly prepared for Marianne’s death. On Day 12, even as Mr. Harris repeatedly assures Elinor of Marianne’s prospects of recovery, Elinor’s reading of Marianne’s condition belies these assurances. Even when Mr. Harris finally confirms Marianne’s recovery, Elinor still has trouble reconciling with the practitioner’s view. The delay in curing Marianne and the repeated misdiagnoses by Elinor point to the uncertainty and unreliability of doctoring in the hands of the lay public. In the event of Marianne’s critical condition, Austen portrays the traits of those attending the invalid, which may be different from those they usually display. While nursing Marianne, Elinor reveals immaturity commensurate with her age. She has been considered a paragon of sense and reason, but her nursing shows inexperience contrary to her apparent prudence and composure. Although Mrs. Jennings’s love of gossip and her meddling have been annoying to Elinor and Marianne, here, despite the danger of infection, Mrs. Jennings stays at Cleveland and sincerely supports Elinor. Imperfect as she is, Mrs. Jennings is kind and affectionate, fitting for a guardian and surrogate mother to the Dashwood siblings. Brandon is taciturn as usual, but he calmly does everything to help Elinor. His honesty shows his unchanged love for Marianne and care for her family. As these examples clearly show, in Austen’s novels, the manner of responding to diseases and illnesses is a strong evidence of an individual’s judiciousness and moral qualities because curing diseases requires knowledge and skill as well as goodwill, and the attitude to others’ ailments is determined by the capacity to feel sympathy for others’ distresses. Indeed, doctoring ability is often associated with a person’s integrity. In addition to diagnosing and curing themselves, Austen’s characters actively help others preserve their health. Some lay doctors, like Anne Elliot, actually help their “patients,” but other lay doctors (like Mr. Woodhouse and the Parker sisters) show themselves to be bossy and interfering, and they often put the “patients” in danger because they want to control a situation beyond their scope of knowledge. Although lay doctoring is represented in a number of Austen’s works as a futile and injudicious exercise, the practice is absolutely necessary in the rural communities Austen describes. In such places, few medical practitioners would be available for the emergencies common to everyday life, and these doctors and surgeons would charge fees beyond the means of a majority of the rural folk. 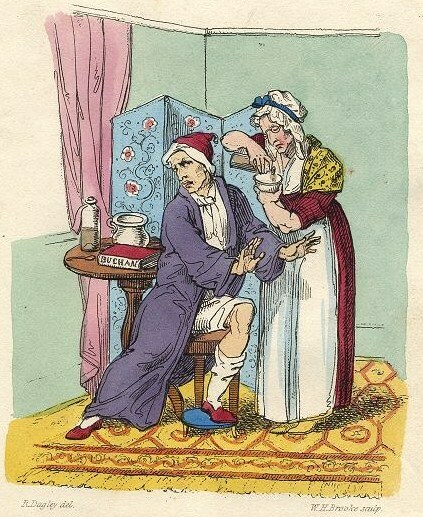 Dorothy and Roy Porter suggest that eighteenth-century people had a penchant for self-doctoring—actively dispensing medical advice to others, taking up bloodletting and other minor operations, and discussing each other’s cases within the family circle; in other words, “self-dosing circles” were formed everywhere (41-46). This trait is depicted faithfully among Austen’s characters. She should be always cool, composed, and recollected; to the questions put by the anxious relations, she should give direct answers, and a ready opinion concerning the present appearances. To the patient she should always appear chearful and humane; should avoid being particular; but, when obliged to be explicit, she should set before her every encouraging circumstance. Not only midwives but also laywomen needed such attitude because in Austen’s time, even in an upper-class household, a female relative would assist a midwife. It is well-known that Austen’s brother Edward had eleven children, and the Austen sisters were summoned to help at childbirth. Austen’s amateur nurses likewise have the same qualities mentioned by Hamilton, and they are capable of proper doctoring as well as nursing. Anne Elliot is the prime example. In all of Austen’s writings, it is Anne Elliot who performs the most brilliant lay doctoring and nursing work. Anne has greater maternal affection and is better at handling her nephews than her sister Mary; John Wiltshire asserts that Anne’s worth is best displayed when she works as a nurse to her nephew (168). When Louisa is injured, however, Anne changes her role of an affectionate nurse to that of a clear-headed lay nurse-doctor. First, even while the others are still struggling to react, Anne diagnoses that Louisa is severely injured: “There was no wound, no blood, no visible bruise; but her eyes were closed, she breathed not, her face was like death” (109). Then, she directs first aid and prevents the body temperature from dipping lower: “‘Rub her hands, rub her temples; here are salts’” (110). Buchan writes that when a person falls unconscious after an accident, keeping the body warm is essential, and he advises rubbing the patient with hot clothes or salt (549-50). It is Anne alone who carries salts (possibly aromatic) for emergencies. She also suggests that the injured be carried to the inn, where she can be kept quiet and warm. Further, Anne knows that an amateur treatment is subsidiary after all, so she sends for a surgeon and offers advice on how to find him at once, even as Wentworth loses hope of Louisa’s recovery. (Anne is wiser than Elinor, who wastes six days in trying home remedies for Marianne.) Finally, Anne pays attention to the rest of her party. Caring for the attendants, in fact, is a significant part of a nurse’s work. Anne’s doctoring proves that a good nurse is capable of good doctoring, even in an emergency. Upon a close examination of this scene, and Anne’s language in particular, Barbara McLean says that Anne is the “perfect doctor,” carrying out all the medical interventions that are required in an emergency (173). This event not only attests to Anne’s rationality and inner strength, but it also gives Wentworth an opportunity to respect her again. Here, medical competence is inseparably linked with an individual’s moral qualities. Names or terms, when improperly employed in matters of science, necessarily create confusion and error; but had this fashionable term [bilious] been productive of no untoward practical consequences, I should have considered any attempt to combat the idea as unnecessary and absurd. But I have observed so many injurious effects from the adoption of this idea, that I think it my duty to be at some pains to point out the danger of it. Adair asserts that with the spread of information, a particular medical term was misused and that patients misdiagnosed their ailments and self-medicated wrongly as a result. Medical enlightenment, thus, did not always produce good results. Ignorance and presumption are generally concomitant. . . . [T]hose who have only caught the eel of science by the tail, happily conceive they have no difficulties to encounter. Mrs. Parker’s opinion makes sense: “‘I do think the Miss Parkers carry it too far sometimes’” (388). Likewise, Charlotte Heywood finds no symptoms of illness in the Parkers and thinks that their healthcare goes too far. As is evident in these observations, the doctoring of the Parker siblings presents a paradox that those caring for their health never feel well. The Parker sisters exemplify the behavior of the lay public who presumed to be their own physicians and were often entrapped in the web of their own confidence. Adair strikes a note of warning against such would-be physicians. There are six points in his argument: first, quacks are ignorant and their medicines do nothing good; second, prescribing suitably for changeable constitutions is difficult; third, every disease is dangerous and early treatment is necessary; fourth, licensed apothecaries dispense better medicines than quacks; fifth, usually, physicians are not called until a critical juncture; and finally, the medical profession is not lucrative (125-70). His advice sounds commonplace and reasonable today, but it did not to the eighteenth-century public who desperately sought health. If their diseases were cured, they did not mind whether it was by their own hands, by qualified practitioners, or by quacks. Unless diseases were cured, medical professionals were considered, to quote the Parker siblings, a “Medical Tribe” (386). It was out of the question for people to leave doctoring entirely to them. Lady Denham, another Sanditon character, is healthy, and cleverer than the Parker sisters. Yet, she says, “‘It wd be only encouraging our Servants & the Poor to fancy themselves ill, if there was a Dr at hand’” (393). Medical professionals had to wipe out the prejudice of the Lady Denhams and the Diana Parkers to gain worldly trust and esteem. Austen’s writings demonstrate the validity of Adair’s opinion to a great extent and reflect the professionalization of doctoring, a process which was ongoing in her lifetime. As we already see in Marianne’s fever, treatment by a practitioner, even one unsure of his own diagnoses and prescriptions, is better than that by a layman. After Sense and Sensibility, a medical amateur is no longer in charge at the bedside of an invalid in a critical condition. Like Marianne, Tom Bertram ignores his physician’s advice after falling off a horse and becomes seriously ill; however, unlike Marianne, he is entirely subject to care by the physician. In Emma and Persuasion, practitioners are more competent and treated with some respect, echoing the rise of their social status. Austen’s practitioners are not key persons, and their voices are unheard in the novels. However, an analysis of Austen’s best-known practitioner, Mr. Perry, is helpful in ascertaining some realities of a successful eighteenth-century country practitioner. In an age when hospitals and dispensaries were mainly for the poor, practitioners visited their middle-class patients at home. Mr. Woodhouse’s comment hints that home visits form the principal part of Mr. Perry’s living: “‘he has not time to take care of himself—he tells me he has not time to take care of himself— . . . he is always wanted all round the country. I suppose there is not a man in such practice any where’” (101). Mr. Perry is seen on the way to and from house calls: Emma, from the door of Ford’s, sees him “walking hastily by” (233); Mr. Elton meets Mr. Perry coming back from Clayton Park (probably the house of a rich patient). Mr. Perry advises Mr. Woodhouse on a minor subject like the wholesomeness of a wedding cake and dispenses medicines such as a cordial for Harriet’s cold. He might also undertake midwifery. To estimate Mr. Perry’s income, Irvine Loudon’s study is informative. Loudon argues that a medical charge was determined mainly by the difficulty of a treatment and by the number and distance of home visits, and little by the income and financial capacity of a patient—a higher fee was usually charged to the rich (“Nature” 17). Mr. Perry is conscientious and attends gratis to the Bates household, of which the income is small. Nevertheless, poorer Highbury residents hesitate to ask for his visits. Contrary to Adair’s assertion, medical charges were not cheap. By the end of the novel, Mr. Perry has earned enough to purchase a carriage. Loudon says that transportation was important especially for the success of country surgeon-apothecaries and that it was their largest expenditure. Physicians in large cities were eager to have a good horse and a grand carriage, yet only a limited number of them could afford such a luxury. Horseback was a chief means of transportation for rural practitioners since horses were a better option for the unpaved roads in the countryside—though a rider had the danger of being thrown off (Loudon, “Doctors” 185-94). Mrs. Perry wants to have a carriage for her husband’s health, but more significantly, its possession would display that he earns as much as a physician does and that he is a gentleman, not a retailer or a druggist any more. Mr. Perry’s success proves that as medicine began to be left to professionals it became a profitable occupation. The events related to the cure of injuries and the preservation of health in Austen’s novels prove beyond doubt that self-doctoring is deeply rooted in the daily lives of her characters, even though they can afford to consult a medical practitioner. Their first impulse in the early stages of an ailment is to try and cure it on their own, and they do so with varying degrees of adequacy. While Anne Elliot’s nursing and doctoring are brilliant, most diagnoses and doctoring do not work. As indicated by the title of Buchan’s manual, “Domestic Medicine,” self-doctoring was a field in which women were allowed to engage. We should note in Austen’s novels that it is mainly women who practice medical treatments. However, as the rather pointed reference “a lady doctor” suggests, some physicians were obviously hostile to the practice of women engaging in doctoring. Sense and Sensibility and Sanditon describe the implications of rivalry between laywomen and male experts. An understanding of the social structure of lay medicine is apparent throughout Austen’s works, and the existence of medical knowledge among laymen is sometimes portrayed as good and desirable, sometimes as vacuous—bordering on ignorance, but most often as patchy and partial. Austen undoubtedly had an opinion of her own, but her primary interest lay in examining medicine as a part of the social fabric. It has always been obvious to critics that Anne Elliot shows her intellectual and moral integrity in the way she responds to Louisa’s accident. Yet the extent to which this account is based on the medical system prevalent in Austen’s own society, and whether the entire system is implicit in her work, have not previously been analyzed. The implications of this discussion can be extended further. As in other subjects, there is in medicine a predisposition to favor knowledge over traditional practice, and intelligence in the application of knowledge over half-remembered or misapplied remedies. Austen’s works register the tension between lay and professional practitioners of medicine; these were dynamics emerging in her own era, and her narrators were bestowed with a tendency to favor professional advice over lay opinions. In the war over medical ideas, Austen might thus be considered a modernizer. This article is an expanded version of a paper presented at the New Directions in Austen Studies Conference at Chawton House Library, on 11 July 2009. Adair, James Makittrick. Medical Cautions. Bath, 1786. Austen, Jane. The Works of Jane Austen. Ed. R. W. Chapman. 3rd ed. Oxford: OUP, 1932-69. Buchan, William. Domestic Medicine. 18th ed. London, 1803. Gorman, Anita G. The Body in Illness and Health: Themes and Images in Jane Austen. New York: Lang, 1993. Hamilton, Alexander. A Treatise on Midwifery. London, 1781. Loudon, Irvine S. L. “Doctors and Their Transport, 1750-1914.” Medical History 45 (2001): 185-206. _____. “The Nature of Provincial Medical Practice in Eighteenth-Century England.” Medical History 29 (1985): 1-32. McLean, Barbara. “Professional Persuasion: Dr. Anne Elliot.” Persuasions 15 (1993): 170-77. Porter, Dorothy, and Roy Porter. Patient’s Progress: Doctors and Doctoring in Eighteenth-Century England. Stanford: SUP, 1989. Porter, Roy. Disease, Medicine and Society in England, 1550-1860. Cambridge: CUP, 1995. Smith, Elizabeth. The Compleat Housewife. 15th ed. 1753. Introd. Elizabeth Kowaleski Wallace. Chawton, UK: Chawton House Library, 2009. Wesley, John. Primitive Physic. 24th ed. London, 1792. Willich, A. F. M. The Domestic Encyclopaedia. 4 vols. London, 1802. Wiltshire, John. Jane Austen and the Body: “The Picture of Health.” Cambridge: CUP, 1992.